Hello crafty friends, Sarah here with two layouts using the stunning Simple Stories 'Let's Party' collection. The layouts are an 8.5X11 inch size to fit in my family album for 2017. We celebrate two family birthdays in March - the first being my mum's birthday mid month and my oldest son's birthday at the end of the month. I have designed these two so they are back to back, using only one page in my album. The Let's Party bundle can be purchased in the online Shop and Crop store here. 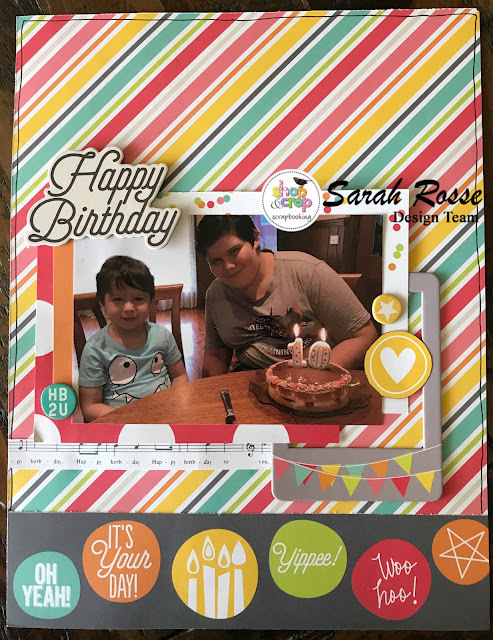 This first layout uses the patterned paper as the base and a second piece trimmed down to mat the photo. I just love the musical backdrop of this paper with the words to 'Happy Birthday' and the stars at the bottom. 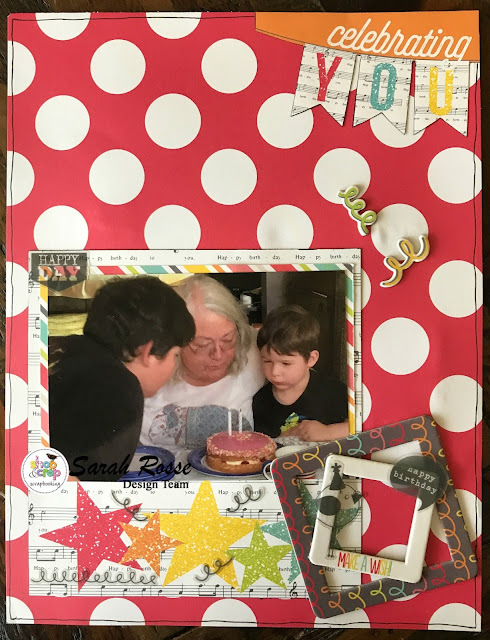 I used the Let's Party Chipboard frames to the right of the photo and layered two on each other to give a raised effect. The Let's Party clear stickers compliment the collection nicely and you can see many of them on this layout, but I especially love the little bird I added to the chipboard frames - so cute!. On the top right hand of the layout, the 'celebrating YOU' accent came from the cut apart patterned paper sheet. A tip is to think flexibly about how to use these cut apart sheets - they are not just for people who enjoy pocket page layouts, but you can easily cut them apart to suit a traditional layout as I have done here. The party streamers to the top right of the photo are from the delightful Let's Party Bits and Pieces. All of these products can be found instore by clicking here. For the second layout, again patterned paper was the base of the layout. The bottom strip was cut from another piece of cut apart paper - the range of paper in this collection is so versatile and creates so many opportunities for creating your own embellishments. The photo was layered and stuck on top of another of the chipboard frames. The Let's Party chipboard stickers were used to finish of the layout. I just love the 'Happy Birthday' sticker - this could be used for cards or layouts given it's size and style. Thankyou for joining me for these projects and I look forward to seeing what you create with the Simple Stories 'Let's Party' collection! These layouts look wonderful.. perfect party papers!